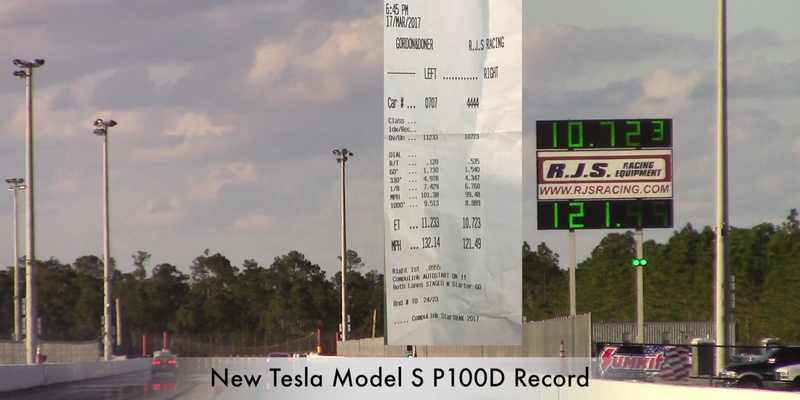 Last month, Motor Trend managed to make a 10.5-second quarter mile run in a stock Tesla Model S P100D with the new ‘Ludicrous+’ software upgrade, but it has not been replicable in the real world, aka uncorrected time on the dragstrip. Before that, the best time recorded on the dragstrip since ‘Ludicrous+’ was 10.726 seconds, which was good enough to be a record for any stock production electric car or any stock 4-door sedan. There’s apparently room for improvements and the options on the vehicles can make a good difference since the record has now been broken with a 10.723-second run. DragTimes filmed two separate races with two different Model S P100Ds on the latest software, but one of them had no sunroof and fewer options, which adds up to about 300 lbs lighter than the other fully-equipped P100D. They put those cars against a Camaro ZL1 and a BMW 550i. The gas-powered cars had no chance, but it’s also interesting to see the difference between the two P100Ds in the same conditions. The heavier one ran a 10.875-second quarter mile with the lighter on ran a 10.723-second, as previously mentioned. The difference with the weight reduction is encouraging for Electric GT’s own stripped-down Model S P100D. The 1,100 lbs weight reduction that they are claiming could make a much bigger difference. They already announced that they think it will be able to accelerate from 0 to 60 mph in 2.0 seconds – or almost half a second faster than those two P100Ds in the video above, but they didn’t release any quarter-mile run.